Greenplum Command Center workload management works with resource groups, the new Greenplum Database resource management system. The default resource management system for Greenplum Database is resource queues. To use the Command Center workload management features, you must first enable resource groups in Greenplum Database. Command Center can assist you in enabling resource groups and in importing existing resource queues to resource groups. 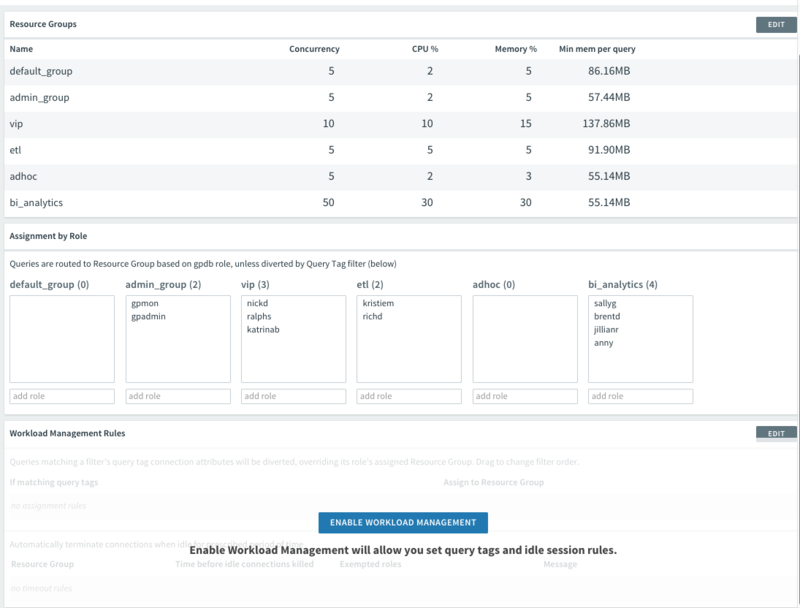 If your Greenplum Database system is still configured to use resource queues, the Command Center Admin> Workload Mgmt view describes the benefits of resource groups and workload management with Command Center and provides a link to the Greenplum Database documentation to help you enable resource groups. Click VIEW RESOURCE GROUP SET UP GUIDE for instructions to enable resource groups in your Greenplum Database system. After you have enabled resource groups and restarted Greenplum Database, restart Command Center (gpcc start), log in, and choose Admin> Workload Mgmt. The workload management view now displays a preview of resource groups converted from your existing resource queues. You can use this one-time view to convert your Greenplum Database resource queues to resource groups. The resource group list includes the required admin_group and default_group resource groups, and a row for each of your existing resource queues. Roles are assigned to the resource group matching the resource queue to which they are assigned. Click the Preview roles link to see the role assignments. If you want to set up resource groups later, you can click SKIP IMPORT. Only the default_group and admin_group resource groups are created. Roles with the superuser attribute are assigned to the admin_group resource group; roles without superuser privilege are assigned to the default_group resource group. If you want Command Center to import resource queues to resource groups, you must complete the resource allocation fields for all resource groups. 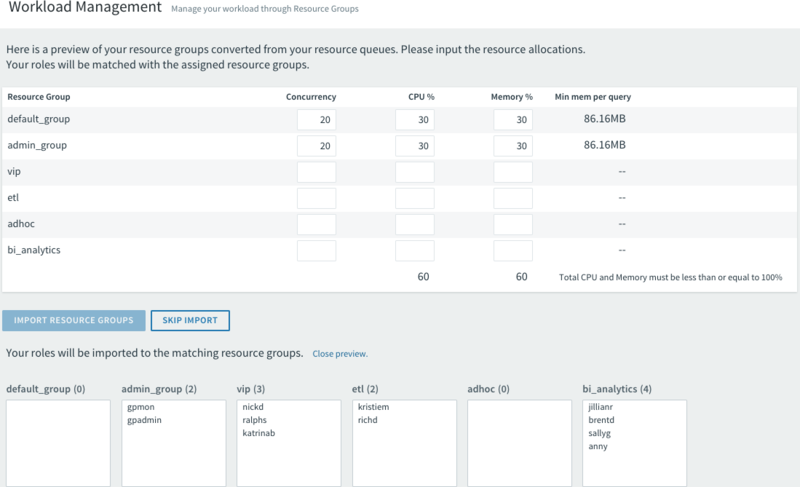 Set the Concurrency, CPU %, and Memory % resource group attributes to allocate Greenplum Database resources to the resource queues. The Concurrency fields must each contain a positive integer. The CPU % and Memory % fields must each contain positive integers between 1 and 99 and the totals for the CPU % and Memory % columns must not exceed 100%. See Defining Resource Groups and Resource Attributes for help determining the values to enter. The IMPORT RESOURCE GROUPS button is disabled until you have entered valid values in the allocation fields for every resource group. When you are ready to import the resource groups, click IMPORT RESOURCE GROUPS to create the resource groups. After you import (or skip importing) resource queues to resource groups, you can enable Command Center workload management. Click ENABLE WORKLOAD MANAGEMENT to enable workload management in Greenplum Command Center. Greenplum Command Center creates the gp_wlm extension, the gpcc.workload_config table, and the associated user-defined functions in Greenplum Database. You are now able to use the Command Center Workload Management interface to add, remove, and configure resource groups; change role assignments; and define workload management rules. See Workload Management for help using the Command Center Workload Management view.